Beginning September 15, “The Horrors of Blumhouse” Takes Possession of Universal Studios’ “Halloween Horror Nights” in Two New Mazes Inspired by Acclaimed Contemporary Horror Producer Jason Blum’s Blockbuster Movies. UNIVERSAL CITY, Calif., ORLANDO, Fla.– Jason Blum, one of today’s most prolific producers of contemporary horror films, brings his signature movies to life in the uniquely distinctive “The Horrors of Blumhouse” maze at this year’s “Halloween Horror Nights” event at Universal Studios Hollywood and Universal Orlando Resort, beginning Friday, September 15. Click HERE for a video of the terror that await! Based on The Purge, Sinister and Insidious franchises, as well as the upcoming thriller Happy Death Day, Blumhouse Productions (Split, Get Out, Whiplash ), is teaming with the creative minds behind the nation’s most intense and immersive Halloween event to unleash three twisted Blumhouse films in one bone-chilling experience at each Halloween destination. At Universal Studios Hollywood, legions of terrified guests will come face-to-face with the most iconic and unnerving moments from the blockbuster The Purge franchise, Sinister movies and soon-to-be released Happy Death Day. In The Purge, guests will attempt to survive the night as they are immersed in the film’s depraved world, where all crime is declared legal as part of the government’s annually sanctioned 12-hour Purge. In what can be described as a living trailer for Happy Death Day, guests will experience a deja-vu scenario as they are forced to relive the last day of their lives over and over again in an attempt to escape a masked killer. The final nightmare will unmask itself in Sinister, where guests will encounter an ancient pagan deity who is determined to trap them in the sordid shadow world of the dead…for all eternity. Upon entering “The Horrors of Blumhouse” maze at Universal Orlando Resort, guests will attempt to survive three of the most menacing anthologies in the Blumhouse assemblage. First, guests will face the horror of becoming stars in the next home murder movie of the menacing demon Bughuul, from the infamous Sinister franchise. Then, they’ll run for their lives to escape the gang of bloodthirsty home invaders from the first installment of The Purge saga. Finally, guests will be thrust into the Further from the Insidious legend, where they’ll come face-to-face with the paralyzing Lipstick-Face Demon from Chapter 1 and witness Dr. Elise Rainier’s own personal hauntings from her nightmarish childhood in a first-look at Insidious: Chapter 4 – in theaters January 5, 2018. Universal Studios Hollywood is The Entertainment Capital of L.A. and includes a full-day, movie-based theme park and Studio Tour. As a leading global entertainment destination, Universal Studios Hollywood delivers highly themed immersive lands that translate to real-life interpretations of iconic movie and television shows. Recent additions include “The Wizarding World of Harry Potter ™” which features a bustling Hogsmeade village and such critically-acclaimed rides as “Harry Potter and the Forbidden Journey” and “Flight of the Hippogriff™,” Universal Studios Hollywood’s first outdoor rollercoaster. Other immersive lands include “Despicable Me Minion Mayhem” and “Super Silly Fun Land” as well as “Springfield,” hometown of America’s favorite TV family, located adjacent to the award-winning “The Simpsons Ride™” and the “The Walking Dead” daytime attraction. The world-renowned Studio Tour is Universal Studios Hollywood’s signature attraction, inviting guests behind-the-scenes of the world’s biggest and busiest movie and television studio where they can also experience such authentic and immersive thrill rides as “Fast & Furious—Supercharged.” The adjacent Universal CityWalk entertainment, shopping and dining complex also includes the all-new multi-million dollar, completely redesigned Universal CityWalk Cinema, featuring deluxe recliner seating in screening room quality theatres, and the “5 Towers” state-of-the-art outdoor concert stage. Updates on “Halloween Horror Nights” at Universal Studios Hollywood are available online at HalloweenHorrorNights.com/Hollywood and on Facebook at: “Halloween Horror Nights – Hollywood,” on Instagram at @HorrorNights and Twitter at @HorrorNights as Creative Director John Murdy reveals a running chronicle of exclusive information. Watch videos on Halloween Horror Nights YouTube and join the conversation using #UniversalHHN. “The Horrors of Blumhouse,” is the final maze in Universal Studios Hollywood’s “Halloween Horror Nights” lineup, featuring frightfully fun films from acclaimed horror producer Jason Blum. In this immersive experience, The Purge, Sinister and the all-new Happy Death Day will come together to terrify guests and excite horror fanatics. Below is the full list of mazes and shows at this year’s event. From Stephen King’s The Shining to FX’s award-winning television series “American Horror Story,” this list proves guests are in for a trick and treat this Halloween season. The Shining, inspired by the iconic psychological thriller. “American Horror Story: Roanoke,” based on FX’s critically-acclaimed, Emmy® and Golden Globe® Award-winning television series. “ASH vs. Evil Dead,” based on Starz’s comedy horror television series. “Saw,” based one of the highest grossing horror film franchises of all time. “Insidious: Beyond the Further,” based on the latest Blumhouse Productions’ thriller, Insidious: Chapter 4. “The Horrors of Blumhouse,” based on Jason Blum’s blockbuster movies, The Purge, Sinister, and upcoming film, Happy Death Day. “The Walking Dead,” Universal Studios Hollywood new permanent attraction inspired by AMC’s record-breaking television series. 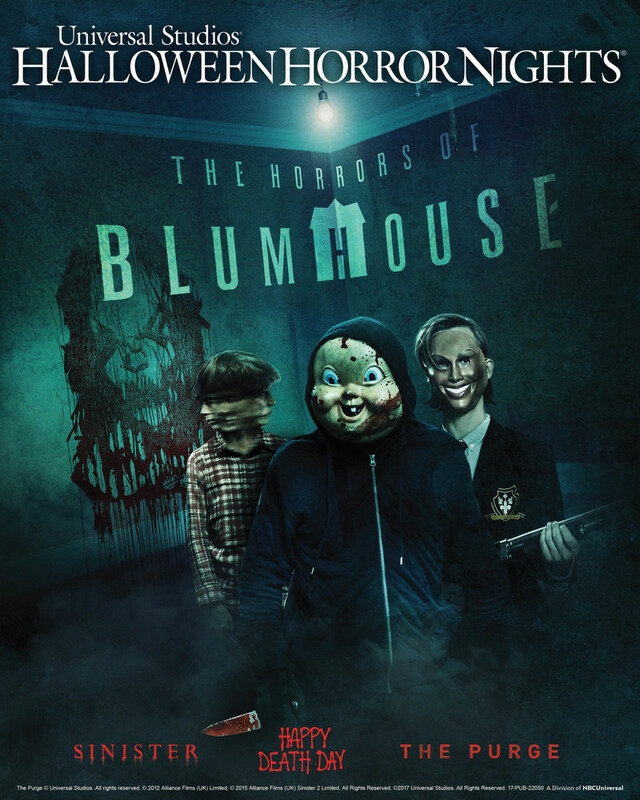 Blumhouse Productions, founded by Academy Award®-nominated and two-time Emmy and Peabody award-winning producer Jason Blum, is a multi-media company known for pioneering a new model of studio filmmaking: producing high-quality, micro-budget films. In 2017, Blumhouse produced the critically-acclaimed blockbusters Get Out from Jordan Peele and Split from M. Night Shyamalan, which have grossed more than $500 million worldwide off combined budgets of less than $15 million. In addition, Blumhouse is the producer of the highly profitable The Purge, Insidious, Sinister and Paranormal Activity franchises, which together have grossed more than $1.7 billion worldwide. Blumhouse’s films also include the Academy Award®-nominated Whiplash, as well as The Gift, Unfriended and The Visit. In 2017, Blum launched an independent TV studio with investment from ITV Studios. Current projects include Sharp Objects, a mini-series for HBO starring Amy Adams, based on Gillian Flynn’s bestselling novel of the same name, and a mini-series for Showtime based on journalist Gabriel Sherman’s reporting on former FOX News chief Roger Ailes. Previous PostCassini’s Grand Finale orbits — the final orbits of its nearly 20-year mission — between the rings and the planet where no spacecraft has ventured before on September 15, 2017.Next PostCars Land Transforms for ‘Haul-O-Ween,’ Oogie Boogie Takes Over Disney California Adventure, and Guests Now Get to ‘Mix-In’ at Both Parks Prior to Mickey’s Halloween Party, September 15 – October 31.